1. Isn’t this one of the cutest cars you’ve ever seen? 2. Yellow + vintage + typewriter = bingo! 3. I love coloured tights, so when I saw these I had to pin them! 4. A fabulous yellow coat, a vintage bicycle and ice cream? Don’t mind if I do! 5. I adore the daisies on this fifties-esque dress. 6. I never could resist a man in yellow trousers! 7. This wisteria is eye-popping against the canary-yellow wall. 8. This armchair is so stylish – I love the fabric. 9. Bright yellow is such an amazing shade for a front door. 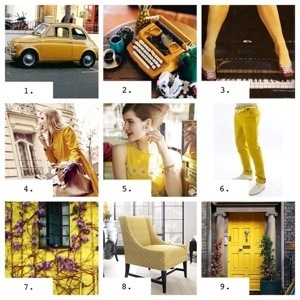 You can see where all these fantastic and inspirational yellow images were pinned from on my To dye for – yellow Pinterest board. Beautiful! I used to have one of those yellow Fiat 500s – she was a joy to drive.